Fort Kent town councilors voted unanimously on Monday to adopt saying the ‘Pledge of Allegiance’ prior to all upcoming town council meetings. FORT KENT, Maine — Fort Kent town councilors voted unanimously on Monday to adopt saying the ‘Pledge of Allegiance’ prior to all upcoming town council meetings. Councilor Joey Ouellette requested that the council take the issue up for consideration during Monday’s regular meeting. Ouellette’s fellow councilors, Scott Pelletier, Carroll Theriault, and Corey Pelletier all indicated their support for the idea, as did council chair Dr. John Bouchard. “It’s not something that’s been done in the past while I was on the board,” Bouchard said. Bouchard previously served nine years as a member of the Fort Kent Town Council. Former Fort Kent resident Greta Martin was the only audience member of about 22 people in attendance at the meeting who spoke up regarding the issue. After the councilors voted on Monday, the audience broke out into applause in favor of their decision. “I thought since our country appears to be getting more divided, that it would be good to recite (the Pledge of Allegiance) to remember what unifies us,” Ouellette, a former United States Marine said on Tuesday. Also at the meeting, Martin addressed the council regarding flag banners which previously flew on light poles in the town but which the council voted last summer not to continue hanging because they were not printed in mirror image on each side, causing them to be displayed improperly. Martin contributed $15,000 of her own money and helped raise another $5,000 to buy the 135 banners that have flown over the community during the summer months since 2011. 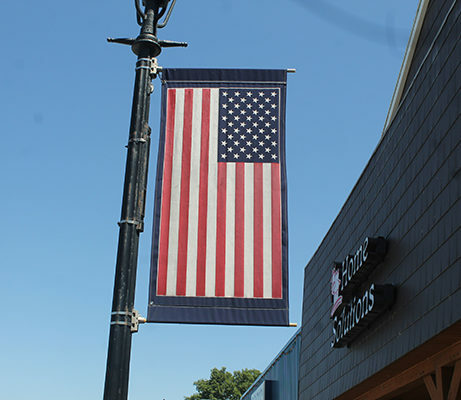 The council voted unanimously in July not to rehang the banners once they were taken down for routine maintenance this fall, after local veterans and other members of the community expressed their dissatisfaction with the flag banners. Martin told councilors on Monday that she ordered new flag banners which she expects to arrive sometime next week. “I want those put up when they come in and I want the other ones back,” Martin told the council. However, as Martin had failed to inform the council that she wanted the issue placed on Monday’s meeting agenda, the council was unable to take action on her request at that time. “Unfortunately, because it’s not on the agenda, we can’t discuss it tonight,” Bouchard explained. “What do I have to do to get your attention,” Martin then asked. Bouchard suggested that Martin attend the next regular meeting of the Fort Kent Town Council at which time her request will be on the meeting agenda. The council is next scheduled to meet on Monday, May 14, at 7 p.m. at the Fort Kent Municipal Building.